(Nanowerk News) A new study will help researchers create longer-lasting, higher-capacity lithium rechargeable batteries, which are commonly used in consumer electronics. In a study published in the journal ACS Nano ("In Situ Transmission Electron Microscopy Probing of Native Oxide and Artificial Layers on Silicon Nanoparticles for Lithium Ion Batteries"), researchers showed how a coating that makes high capacity silicon electrodes more durable could lead to a replacement for lower-capacity graphite electrodes. "Understanding how the coating works gives us an indication of the direction we need to move in to overcome the problems with silicon electrodes," said materials scientist Chongmin Wang of the Department of Energy's Pacific Northwest National Laboratory. Silicon nanoparticles coated in alucone (yellow spheres outlined in orange) expand and contract easily on charging and use. But left to their native silicon oxide covering (yellow spheres in blue), they break down fast on recharging. Thanks to its high electrical capacity potential, silicon is one of the hottest things in lithium ion battery development these days. Replacing the graphite electrode in rechargeable lithium batteries with silicon could increase the capacity ten-fold, making them last many hours longer before they run out of juice. The problem? Silicon electrodes aren't very durable — after a few dozen recharges, they can no longer hold electricity. That's partly due to how silicon takes up lithium — like a sponge. When charging, lithium infiltrates the silicon electrode. The lithium causes the silicon electrode to swell up to three times its original size. Possibly as a result of the swelling or for other unknown reasons, the silicon fractures and breaks down. Researchers have been using electrodes made up of tiny silicon spheres about 150 nanometers wide — about a thousand times smaller than a human hair — to overcome some of the limitations of silicon as an electrode. The small size lets silicon charge quickly and thoroughly — an improvement over earlier silicon electrodes — but only partly alleviates the fracturing problem. 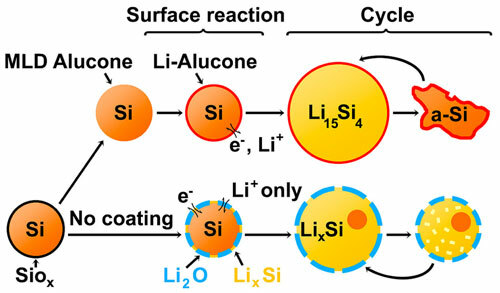 Last year, materials scientist Chunmei Ban and her colleagues at the National Renewable Energy Laboratory in Golden, Colorado, and the University of Colorado, Boulder found that they could cover silicon nanoparticles with a rubber-like coating made from aluminum glycerol ("Reversible High-Capacity Si Nanocomposite Anodes for Lithium-ion Batteries Enabled by Molecular Layer Deposition"). The coated silicon particles lasted at least five times longer — uncoated particles died by 30 cycles, but the coated ones still carried a charge after 150 cycles. Researchers did not know how this coating improved the performance of the silicon nanoparticles. The nanoparticles naturally grow a hard shell of silicon oxide on their surface, much like stainless steel forms a protective layer of chromium oxide on its surface. No one understood if the oxide layer interfered with electrode performance, and if so, how the rubbery coating improved it. To better understand how the coating worked, PNNL's Wang and colleagues, including Ban, turned to expertise and a unique instrument at EMSL, DOE's Environmental Molecular Sciences Laboratory, a DOE Office of Science User Facility at PNNL. Ban's group — which developed the coating for silicon electrodes, called alucone, and is currently the only group that can create alucone-coated silicon particles — took high magnification images of the particles in an electron microscope. But Wang's team has a microscope that can view the particles in action, while they are being charged and discharged. So, Yang He from the University of Pittsburgh explored the coated silicon nanoparticles in action at EMSL. The team discovered that, without the alucone coating, the oxide shell prevents silicon from expanding and limits how much lithium the particle can take in when a battery charges. At the same time, they found that the alucone coating softens the particles, making it easier for them to expand and shrink with lithium. And the microscopic images revealed something else — the rubbery alucone replaces the hard oxide. That allows the silicon to expand and contract during charging and discharging, preventing fracturing. "We were amazed that the oxide was removed," said Wang. "Normally it's hard to remove an oxide. You have to use acid to do that. But this molecular deposition method that coats the particles completely changed the protective layer." In addition, the particles with the oxide shells tend to merge together during charging, increasing their size and preventing lithium from permeating the silicon. The rubbery coating kept the particles separated, allowing them to function optimally. In the future, the researchers would like to develop an easier method of coating the silicon nanoparticles.